Eight men own the same wealth as the 3.6 billion people who constitute the poorest half of people on this planet. 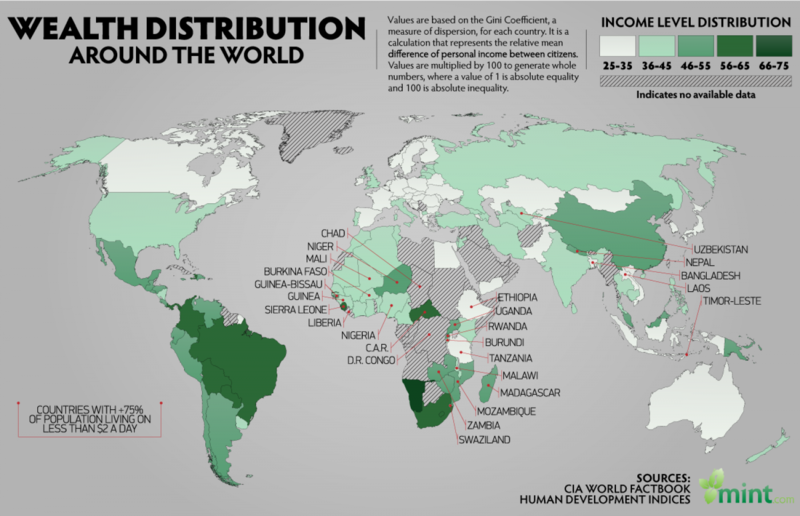 A year ago, using similar data, 9 billionaires owned the same wealth as the poorest half of the planet. 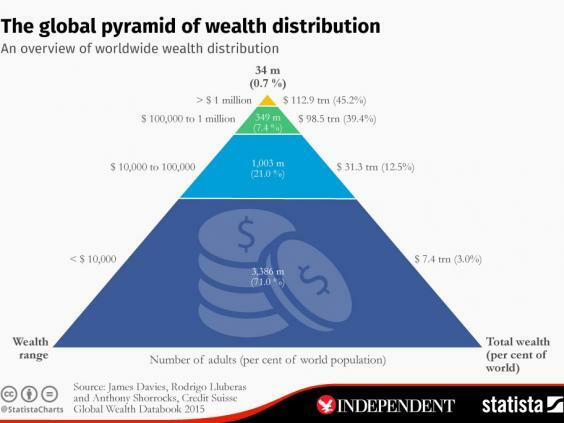 At the rate the super-rich is growing, the world may have its first trillionaire in 25 years. What is a trillion anyway? Well, assuming you spend a million dollars every day, you would have to be around for 2738 years to spend one trillion. In 25 years, the incomes of the rich have risen 182 times as much as the incomes of the poorest. If current trends continue, we would have to wait 170 years for women to earn the same as men. Meanwhile, 1 in 10 people on this planet still lives on less than $2 a day. A woman working 12 hours a day six days a week in a South Asian country earns less than $1 per hour. The CEO of the company that sells the finished product earns over $200 million a year. Just allow these figures to sink in for a moment. Business magazines are fond of publishing lists. They gloat over the youngest billionaires, and come out with meaningless data – 30 under 30 and so on. The notion that the richest are self-made is one of the biggest myths of our time. Over half of today’s billionaires inherited their wealth. The other half have accumulated wealth through businesses and industries where corruption, nepotism, tax evasion, and inversion are rampant. As noted in a recent article (https://www.fortune.com), "fake it till you make it" is the new mantra in Silicon Valley - supposed to be the epicenter of unicorns. As a contrast, consider MONDRAGON, a leading Spanish business group with over 74,000 employees, 12 billion Euros in revenue, 261 businesses, 15 technology centers, offices in 41 countries, sales in 150 countries and assets of over 25 billion Euros. Employees completely own the group. The ratio of the highest paid employee’s income to that of the lowest paid is a healthy 9 to 1. The ratio of CEO salary to the median income in the U.S. is 431 to 1. Of course, you can interpret the data with “alternative facts” and show the ratio to be an egalitarian 4 to 1. Or face reality, as ugly as one can imagine. Corporations can do practically anything and get away with it. Please remember no one had to go to jail for the financial meltdown of 2007. The law is supposed to be the same for everyone. Has anyone been punished for the financial meltdown of 2007? Or the emission scandal at Volkswagen? Or the spurious claims at Mitsubishi? Or the oil spill in the Gulf of Mexico (BP)? Or the blatant wrongdoings at Wells Fargo? Or the data breaches and alleged cover-ups at Yahoo? On the contrary, Yahoo’s CEO is likely to walk away with over $140 million if the merger with Verizon is complete. The reason? Yahoo’s clawback provisions are too weak to be enforced. Wells Fargo allowed the top executive allegedly responsible for the mess to walk away with $125 million. 10,000 miles away, in India, the largest democracy in the world, despite the innumerable scandals that have rocked the country, no politician or top bureaucrat has been punished in 70 years of independence. India’s millionaires – the top 1% - have 45% of the country’s wealth. One person accounted for 11% of the income tax collected in the country last year. India’s population is 1.3 billion. Ideally, the percentage of wealth in the hands of millionaires should be less than 30%. If the rich have more than 40% of the wealth, there is no space for a significant middle class. Japan, ranked as the most “equal” country in the world has just 22% of the wealth controlled by millionaires. Doing quite well are New Zealand (26%) and Norway (27%). Look at the issue from another perspective. Today, the world’s population is 7.4 billion. 60% of the population is on one continent – Asia. In fact, two countries – China and India – account for 37% of the world’s population. The second largest continent by area – Africa – has a population of 1.2 billion or about 15%. The demographics are changing. Projections vary. If we assume that the growth in population will follow a middle path, the world population by 2100 is estimated to be 10 billion. Of course, none of us may be around. Here is the frightening statistic. Almost half of the 2100 population will be on one continent – Africa. Give some thought to the implications. You are probably tired. And rightly so. Think for a moment. How long can this farce continue? When will the bubble burst? It has already burst in some countries. It is likely to burst in the next year or two in much more. The consequences will not be pleasant for anyone. What, if any, is the solution? For a start, we need governments that work for all, not just the 1%. We have documented evidence of the 1% influencing the outcome of elections in several countries. We also have evidence of the 1% getting tax breaks in other countries. In the guise of democracy, we end up having are governments of a few, by a few, and for a few. It is high time that governments started cooperating with each other on critical issues. The race to be the least taxed nation or to be a tax haven or to have secrecy laws must stop. The race may apparently show some winners, but the ultimate loser will be humanity itself. Governments should also seek to reward entities that work for society’s and employees’ well-being rather than the well-being of shareholders alone. As I have pointed out earlier in my posts, the real keys to development are education and health. The countries that come out one top (Unfortunately, the U.S. does not) on happiness indicators year after year are also the ones that have near 100% literacy and robust healthcare for all. Amidst all the gloom, a tiny sliver of light appeared in December 2016. The 2016 Global Forum assembled in Rome. The leaders of some of the largest corporations committed to making a difference to the societies they serve. His Holiness Pope Francis asked the leaders to remember the human faces they were impacting rather than just revenues and profits. Asking leaders who are constantly challenged to produce results to focus on the human side of their transactions is indeed counter-intuitive. Providing a level playing field, equal opportunities, and a genuine concern for those left behind in our quest for success and development is an imperative. The alternative is a world that nobody wants to imagine. The End of a Flat World?